Some said it was the hardest one yet. There was climbing, very mixed terrain and awesome views. What a great way to spend a Sunday afternoon. It was an overcast day but clear - the visibility was amazing - and it was dry on the ground, despite days of rain in the leadup. 60 riders rolled out of Hurstbridge Train Station carpark at about 10:30am. There were a couple of mechanicals before the big climb of the day. Lauren came unstuck at the bottom of Spanish Gully Road and had a lie-down in the ditch. The rough corrugations also caused a couple of pinch flats by the look of it and Slinky was spotted attending to another rider's wonky rear derailer (SRAM neutral support even extends to MGG?!) Ricky was fresh off the plane from Scotland and was doing the best he could with a loaner bike that was very the wrong size and was making bad noises going up the hills. All this before we even got to the first good bit! 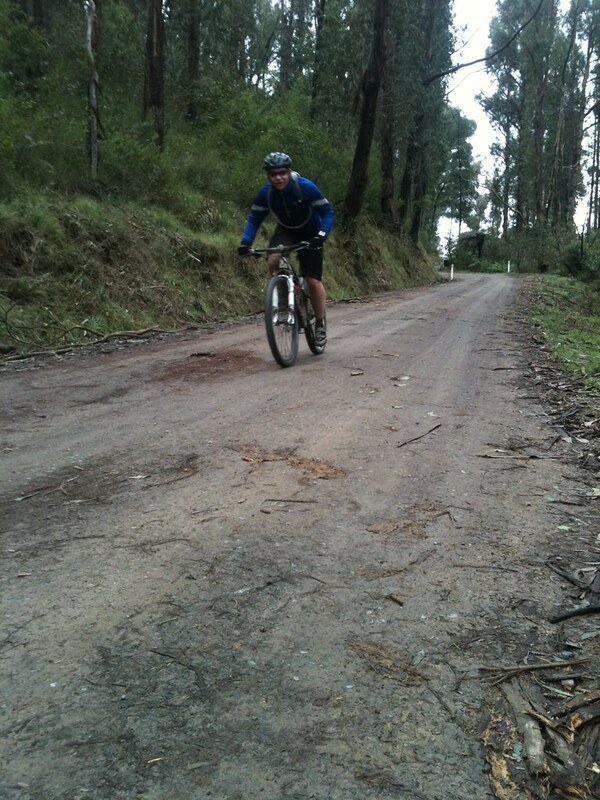 The main climb of the day was Mt Everard Track, or Mt Ever-hard Track as some call it. 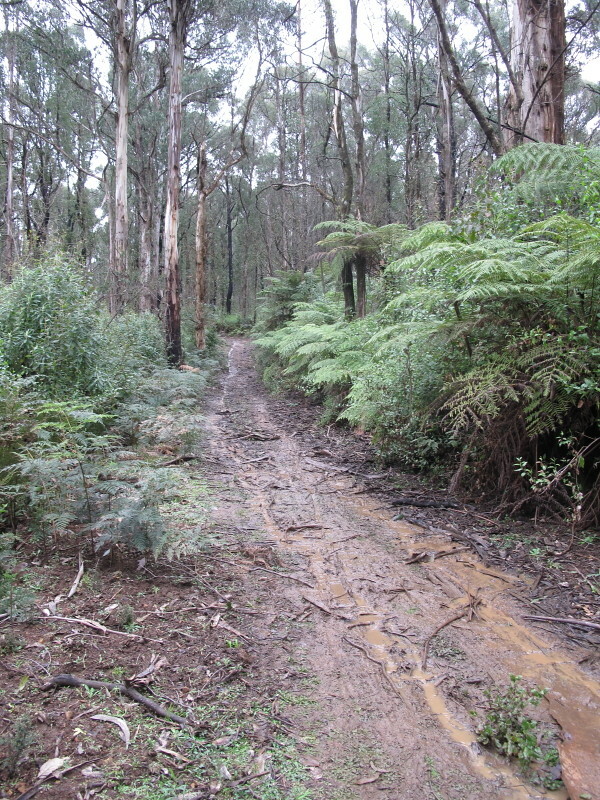 The Kinglake NP Ranger had warned us that there may be large groups of walkers on the track but only a handful were sighted. Riders made their way up the steep and varying grade which was in surprisingly good condition given the recent rain. The rough riding had hammered Dan’s Ortlieb rack mount and forced him to pull over and torque it up to fix the droop. Hayden was all smiles as usual even as he hiked up the steeper parts of Mt Everard, as I suspect a lot of other people did too! There’s a surprising amount of downhill on the ascent up Mt Everard which made for water-bar jumping, pinch-flat inducing, canti-squealing fun. 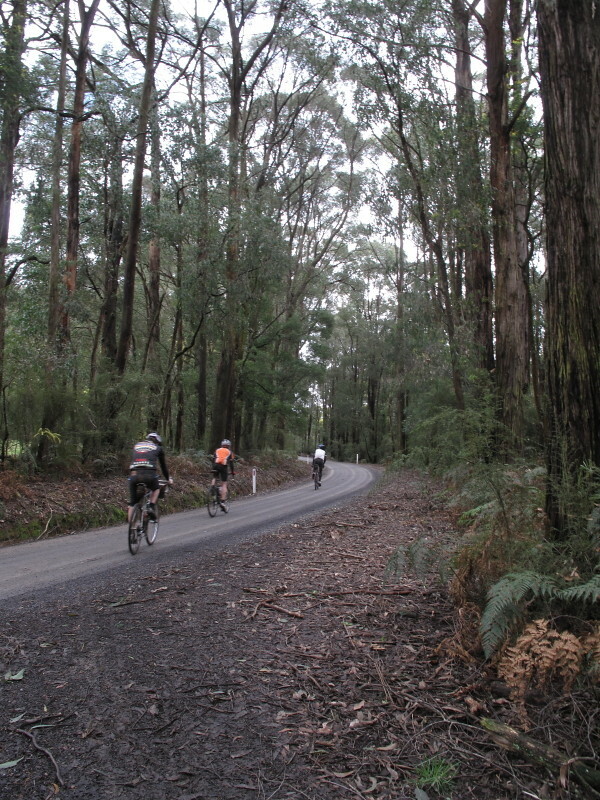 The final downhill pitch spat riders out onto the main road to Kinglake where the cue sheet gave them a choice; easy way = stay on the main road and do the remaining few km into Kinglake on blacktop, hard way = cross the main road and shoot up Cookson Track for more rough riding. Apparently most people took the hard way. Can’t say we didn’t warn you! Cookson Track is hike-a-bike steep for most mortals but apparently some riders dug deep and found enough gears to get up it without dabbing. Chapeau to everyone who rode the whole thing! The Kinglake shop owners made out like bandits what with all the coffees, muffins, gatorades and lollies that were snatched up by hungry riders. Most people seemed happy to hang around and have a chat and a feed before rolling on to the next leg. Nikcee spent his checkpoint time chatting and trying to fix flat tire issues. Makeshift rim tape was sourced from one of the shops and he was good to go. 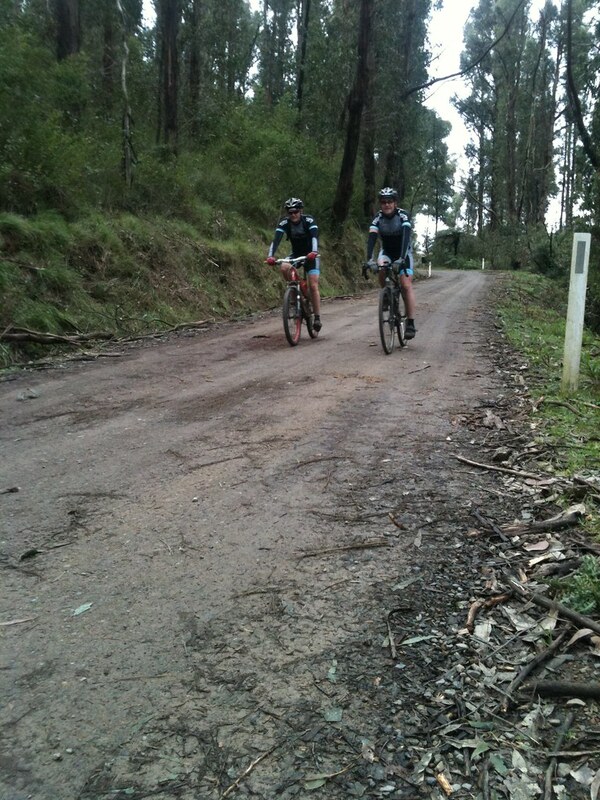 The next section started with a ripper descent down Glenburn Road. It’s such a nice steady downhill grade that one or two riders missed the turnoff half way down. Bummer! 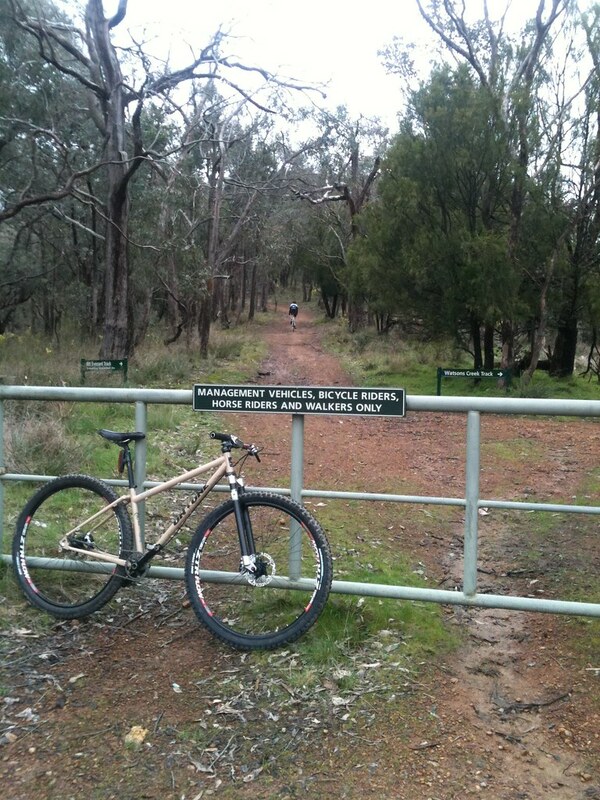 Because that turnoff took riders onto Mountain Creek Track which was, by many accounts, one of the highlights of the day. The final descent down to the bridge was clearly a highlight - those with skinny CX tires (or worse, slicks!) reported much scary fun as they flew down the hill and tried to find the elusive line through boggy ruts, tree branches, slippery roots and huge puddles. Skills were tested, bikes were dropped, faces were lit up with muddy grins, there was much getting of rad. It was smiles all round as riders left the gnarly Mountain Creek Track behind for the gentle climb up Gordons Bridge Road and then started the next highlight of the day, the fast, swooping dirt road descent down to Steels Creek Road. Those with big rings engaged them. The road was wide and well maintained, the corners many and beautifully cambered, the views down into the valley were gorgeous - even though it was overcast, the cloud was high and visibility was off the scale - you could see for miles and miles and miles. Great riding weather. Yarra Glen was the next checkpoint and it sounds like most riders loaded up on a big lunch and, in some cases, a couple of pints as well. Instagram pics of riders playing on kids playground equipment were beamed around the twittersphere. Sounds like everyone had a great time filling their bellies and having a grand old time in Yarra Glen. 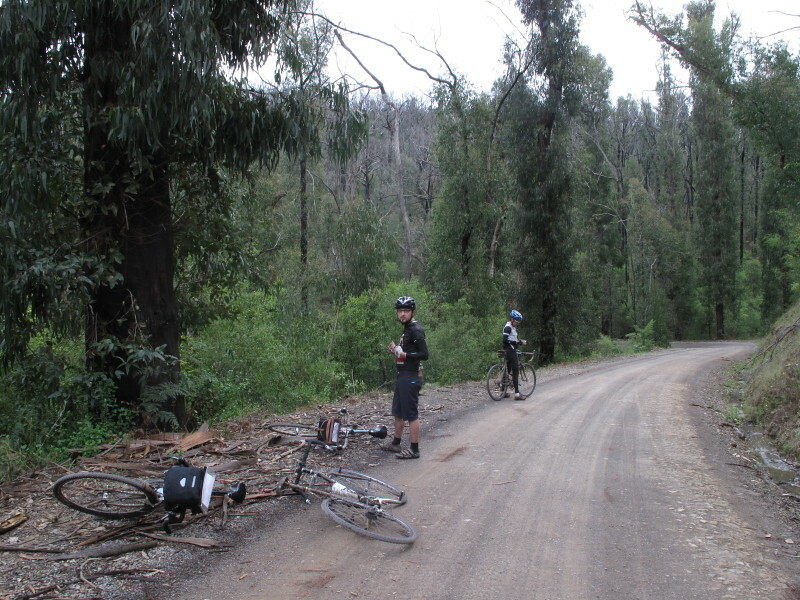 I wonder how many of them took note of the fact that they were now on the other side of the Kinglake Ranges and had just done a whole lot of descending to get down to the floor of the Yarra Valley. 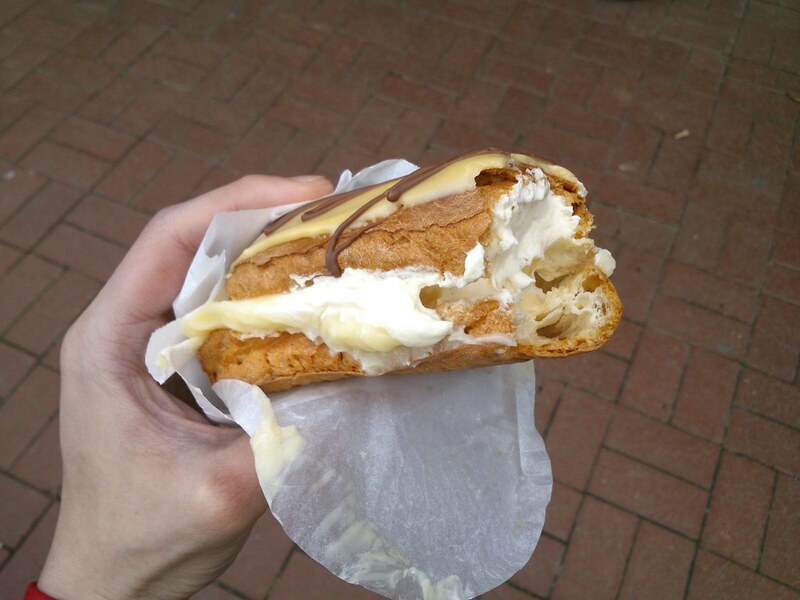 Yes, the canny rider would have twigged pretty soon that you don’t get something for nothing and there’d probably be a leetle bit of climbing soon and, dollars to donuts, it wouldn’t be up the easy way. 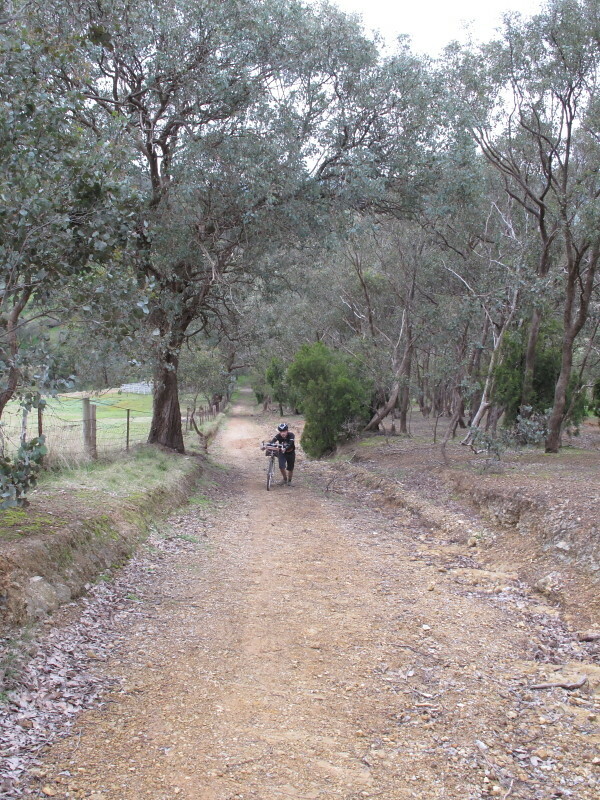 The last leg back along Buttermans Track was easy rolling compared to the earlier climbs. 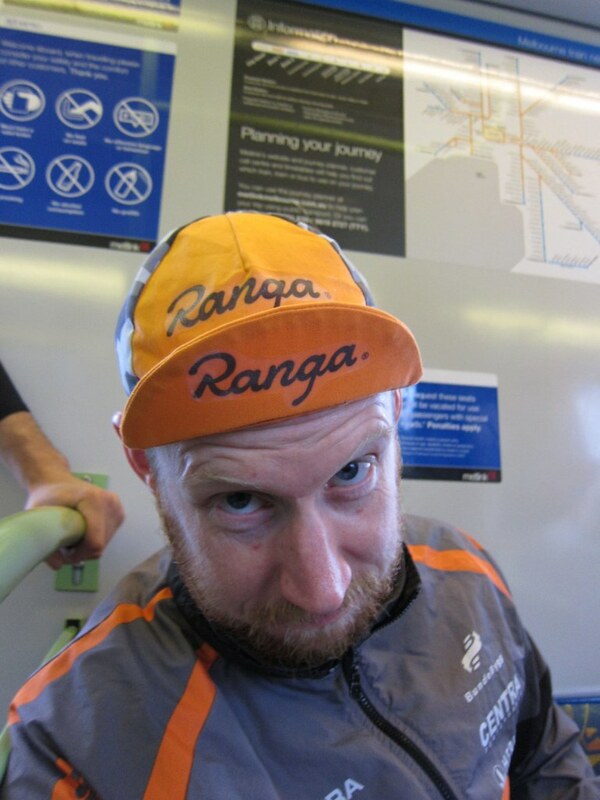 Riders started arriving back at Hurstbridge around 2:25pm. Jason B rolled in first on his beautiful titanium Litespeed. He’s been a regular MGG attendee - he’s ridden every single one - so he got a special prize for his stellar effort : Blakey caught him trying to enter B grade at Dirty Deeds the next week and said, “Nuh-uh! You’re going in A-grade mister!” Well done Jason! Fraser was in next, followed shortly by international hardman Scooter. 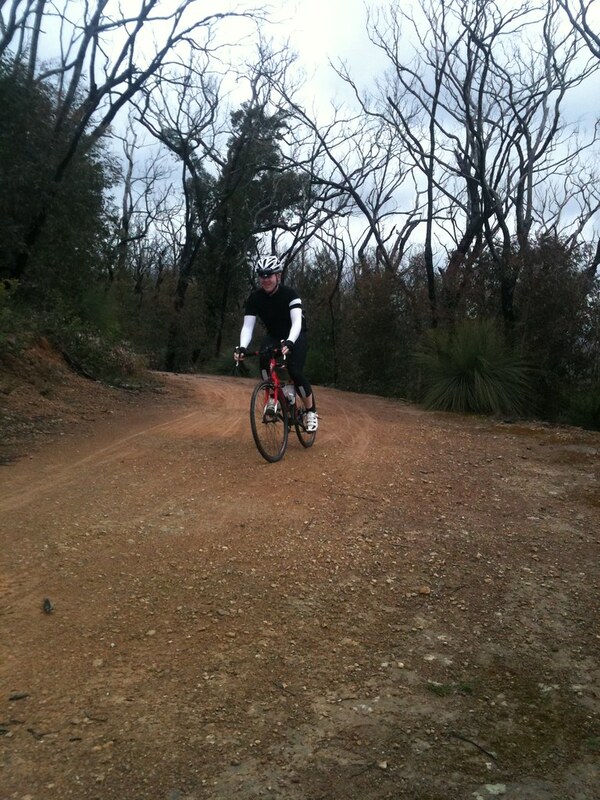 Josie was first woman back to Hurstbridge at about 3:15. I make note of the finishing order because, even though this is not a race, said finishers were awarded a special prize. You see, while the 60 riders were off having their fun on the course - attacking each other on the climbs, pumping down the backside of water-bars, losing it into the ditch around sketchy corners - Blakey rolled straight from Hurstbridge over to Yering Station Winery where he hooked up with Iain at the farmers market that was on that day. 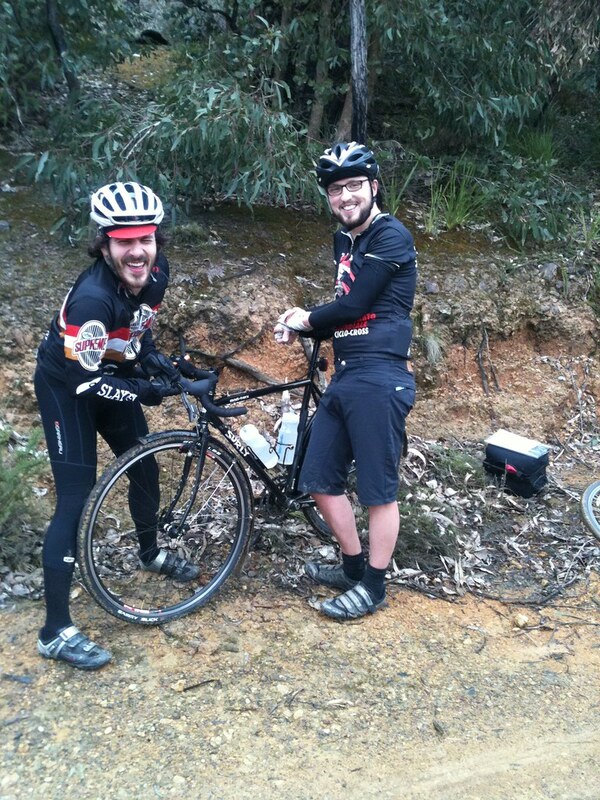 Iain loaded him up with loaves of awesome fresh bread and then Blakey smashed it back to Hurstbridge - even fighting off a slow leak en route - to get back the station in time to present said delicious loaves to the first man and woman to finish the course. Practical beardo bikes ftw! 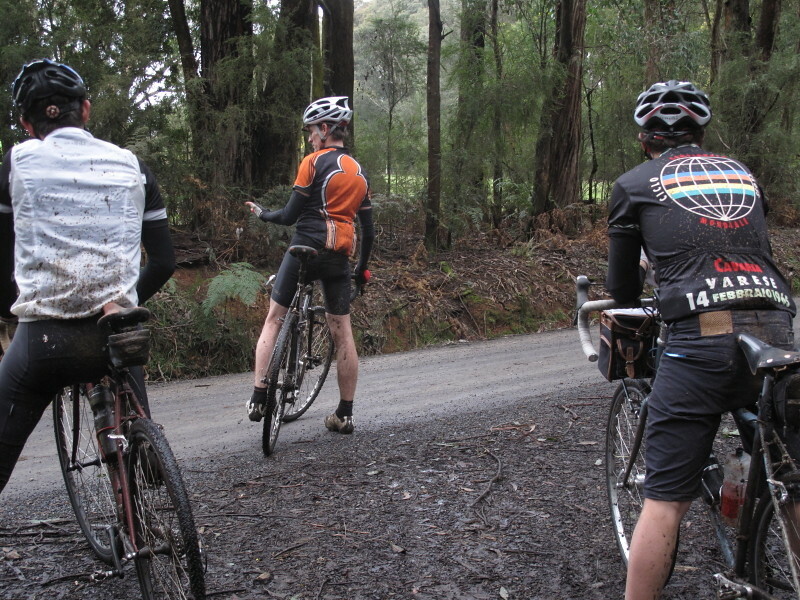 The day drew on and riders rolled into Hurstbridge in dribs and drabs. A couple decided to bail from Yarra Glen and take the easier route to Lilydale Station. Some were just taking their sweet time and having picnics and whatnot along the way. Special mention should be made of John G who arrived at the start looking somewhat over-prepared with a full bikepacking setup on his MTB - tent, sleeping bag, the lot. He’d actually camped out near Mt Everard Track the night before, done the ride (in reasonable time i might add) and then rode home afterwards. I think he’s got his sights set on some rides that are far far bigger than our little gravel grinders. Sally also deserves a special mention but for the wrong reason unfortunately. A pothole incident after dark, just 1km from Hurstbridge Station, saw her hit the deck and make a quick trip to hospital to get patched up. She’s already recovering well - with the aid of a specially baked "get well" loaf from Iain - and said she’ll be at the next Gravel Grinders for sure. Such spirit! It was mostly CX bikes this time, with a good chunk of MTBs too. There were the usual oddities - unclassifiable 650B machines, Rolly’s girlfriend’s old hybrid, a couple of be-fendered tourers. The terrain was so varied that I think each type of bike probably had its moment in the sun where it was perfectly suited to the terrain. Well, until the next turn-off at least. All in all, another successful day. Weather held out, most everyone had fun, what's not to like? Thanks again to Iain for the loaves and all the riders who turned up, rode the course and finished with a smile on their face. Some said it was the hardest course yet. Hm, possibly. But if you say that with a huge grin on your face we’re not going to start making them any easier! Great report! 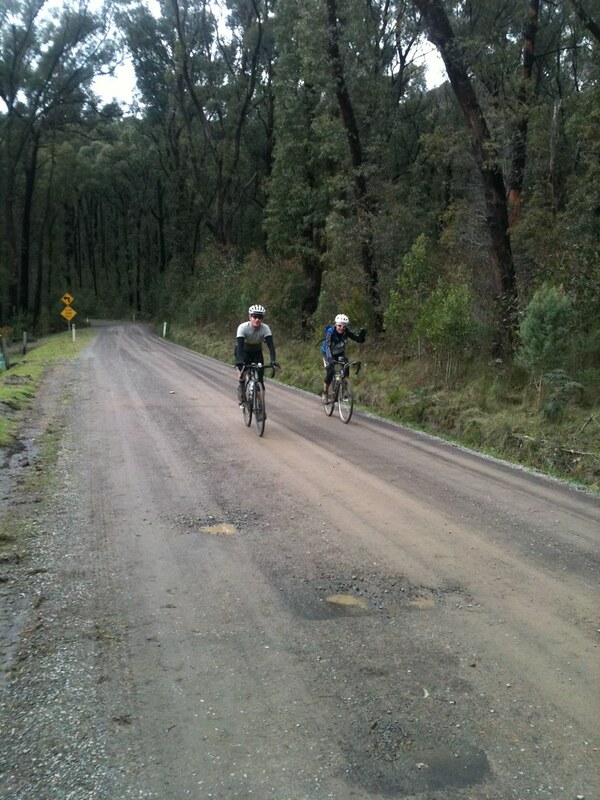 Was our First Gravel Grinder and definately won't be our last! Happy to report the load of bread was very tasty! !